Coconut Ice brings back so many memories. As a child, it was always a party favourite for me. it’s pink and it tastes delicious. Total win. The downside? Coconut Ice was always sugar loaded and would send me on some crazy sugar high. I’ve played around with this favourite to make it even better, more aligned with my goals and better for my health. My coconut ice only uses natural sweeteners, it is vegan, dairy and gluten-free. It is easy to make and delicious. The beetroot powder not only gives that pinky colour but also has plenty of goodness. Beetroot is known to be rich in antioxidants plus contains potassium, magnesium, iron, vitamin C and folic acid. 1 teaspoon of organic beetroot powder is said to contain the goodness of 3 or so fresh beetroots. For the sweetener, I have chosen to use WHOLE EARTH Sweetener Co. the mix being Sweet Granules with Stevia. Perfect for baking it has 97% less calories than regular sugar and the clincher for me is that it is natural. For my Coconut Ice, I use half a cup of Whole Earth Sweet Granules with Stevia and the effect is Coconut Ice which sweetens as if 1 full cup of sugar was used. I’ve tried a few sweeteners and this one if my fave. WHOLE EARTH Sweetener Co. products taste significantly better than other stevia-based sweeteners and they are gluten-free, non-GMO, have no preservatives and no bitter aftertaste. Massive win! I could have also used coconut sugar but by using WHOLE EARTH Sweetener Co. not only did I achieve a better taste I also kept the budget down. I could also get all the ingredients at my local supermarket (New World) so no trekking around. In a saucepan, mix the coconut oil, coconut milk, vanilla and WHOLE EARTH Sweetener Co. Sweet Granules with Stevia on a low heat. Combine ingredients until the coconut oil has melted. Take off heat and mix in the desiccated coconut. Line a shallow baking tray or baking tin with baking paper. Halve the mixture, and press half of it into the baking tray. Place in freezer. Add 1 teaspoon of the beetroot powder to the remainder of the mixture, combine well. This should create a beautiful pink mixture. Add the pink mixture to the base and press it in well. Place the coconut ice in the freezer for at least 2 hours before serving. Cut the coconut ice into squares and store in the fridge. Do you too love Coconut ice? Thank you to WHOLE EARTH Sweetener Co. for making this blog possible. 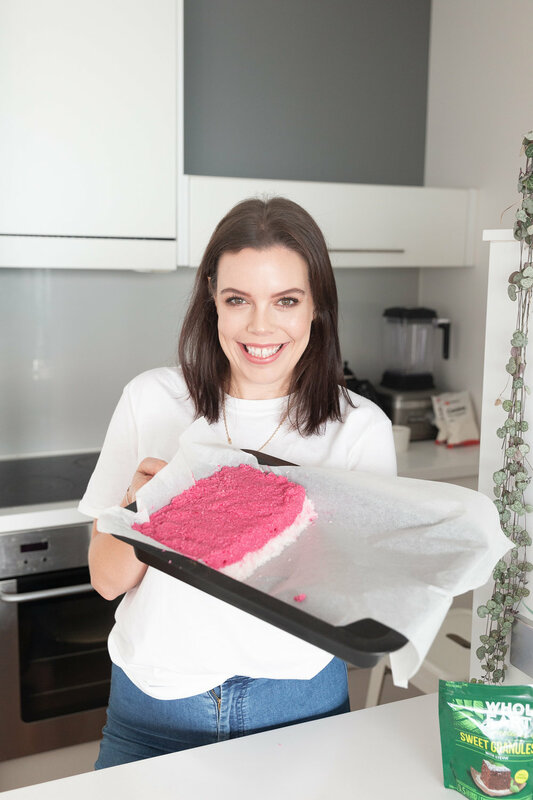 When they approached me to share my own recipe I was super excited to get involved.